What’s cooking got to do with farming? Food is on my mind a lot these days, probably because the holidays are so centered around it in our home. It’s getting a lot of attention everywhere, though. In the press, in new book releases, documentaries, and on the internet, many urgent conversations are going on about finding, growing, buying, and eating nutritious, organic, and local food. Perhaps I am just being optimistic, but in my experience at least, an increasing awareness seems to be taking hold and spreading in the general populace, creating a ground swell of movement in favor of sustainable agriculture. More people than ever before are being exposed to the awful truth about our failing industrial food system, realizing that our grandparents ate better tasting and higher quality food than we do, and are looking to get that pre-WWII level of nutrition and food safety back. The good news is, that’s possible. The not-so-good news is, it requires skills, that not everyone have. Mainly, that way of eating involved a lot of cooking, from scratch. Not just heating up food out of a can, or assembling meals from prepared ingredients, or microwaving frozen dinners. Cooking before the age of supermarkets with their vast offerings of ready-to-eat, processed foods was the real deal. You started with simple, single ingredients, and transformed them into soups, casseroles, breads and pies; main dishes, snacks, breakfast and lunch, and don’t forget, deserts. Sounds romantic and a bit magical, doesn’t it? For the non-cook, it is. 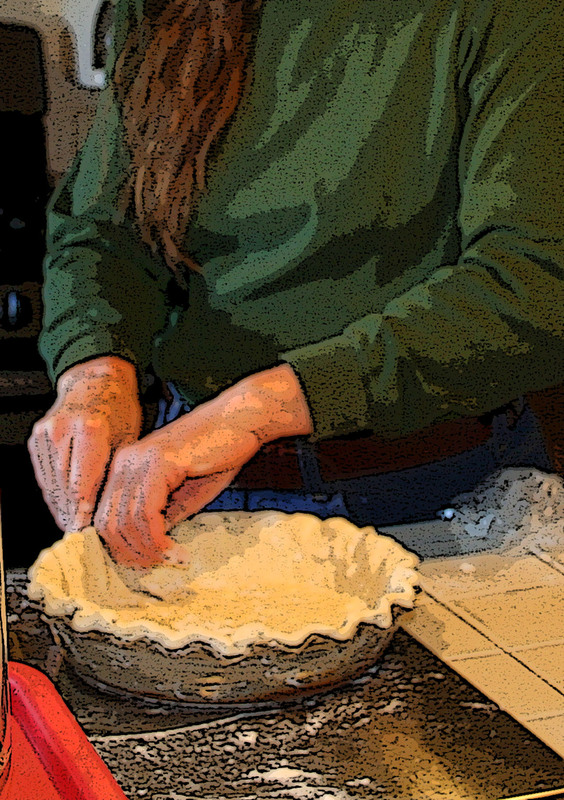 My husband, for instance, would never, ever, attempt to bake a pie. He loves pie, just doesn’t have the foggiest idea how to turn flour, butter, pumpkin, eggs, milk, and various spices into a delicious holiday dessert. And vegetables? If given a pound each of carrots and beets, a half an onion, three cloves of garlic, and a jar of home-canned chicken stock, he could no more make a pot of soup than pull a bunny from a hat. Without my cooking skills, pie for him comes from the bakery section of the grocery store, and soup comes from a can. He’s not alone in that category, and it isn’t just because he’s a man, that he doesn’t know how to cook. It also generally takes more time to cook from scratch, and it creates more dirty dishes than making meals from cans and packages and freezer boxes. These were the drawbacks that Madison Avenue capitalized on as the post-war economy blasted into the rocket age: advertisers convinced women everywhere that cooking was a drudgery that had to be escaped from. The new technology promised fast, delicious, convenient meals for the modern family, and with women joining the work force in leaps and bounds, it was a reasonable proposition with few detractors. Seemingly overnight, cooking became as simple as 1-2-3. Brown some meat, boil some noodles, add a can of soup, and call it dinner. Or, remove pizza from box, bake until cheese is brown and bubbly, and serve. Better yet: cut slit in plastic film over vegetables, microwave on high for 3 minutes; stir, heat 2 minutes more, and enjoy. Not much skill involved, but that’s what makes those sorts of meals really convenient and hard to resist. Sure beats eating out or ordering in on evenings when time is at a premium and the refrigerator is empty; sometimes a frozen pizza is all I have time or energy for, too. Which is as much a part of the skill of cooking as knowing what to do with the ingredients. Planning meals around available foodstuffs, keeping basic ingredients on hand, knowing how to use produce in season, and being willing to invest the daily time and effort required to create meals from real food; this is an entire complex of essential skills for anyone really interested in eating well, whether you grow your own food, buy it from a farmer or farmers market, or shop the organic section in your local supermarket. It is not difficult, but it is a lot of work, if you’re not used to it. It is certainly more work than I want to do at the end of a long day sometimes, and I’m only cooking for two. And I love to cook. And, I’ve been cooking for thirty years, which means I’ve learned a few shortcuts and techniques that make it fun, and I’ve accumulated a wealth of kitchen tools and equipment that make it easier. Still, doing it right can be a struggle many days. But it is worth it. Yes, it is very much worth it. Because every meal I create from food taken straight from the ground or the pasture, as close to where it is grown as possible, is an act of farming. It means I do not need the industrial food system, with its endless, empty variety and addicting convenience, to feed myself and my family. I firmly believe that knowing how to cook with real food is just as critical to changing the shape of agriculture as is making different choices in the food we buy to eat. As surely as eating is an agricultural act, as Wendell Berry has so eloquently said, so too is cooking. Because let’s face it: all the fresh, organic vegetables and meat from healthy, happy animals grown on sustainable farms, are just pretty photo props if you can’t turn them into dinner.